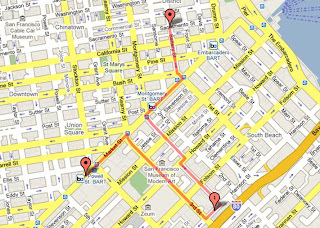 I cut through the financial district down New Montgomery to Harrison and then looped back up 3rd Street. The financial district is pretty classy but a few alleys of grodiness are tucked in there. I like this one - a headless giant. Right? The streets have weirder names down there too. The one really cool thing on Harrison and 3rd - Whole Foods! Third Street is actually really awesome. The Yerba Buena center, Moscone Center, Metreon, SFMOMA, shopping and dining are all down this street. There is even a History of California Pioneers museum. This one is going to the top of my to-do list. I would have been completely confused if they hadn't told me. Ohio doesn't have a Yerba Buena carousel, though. The fog is just getting rediculous. I'm throwing in the towel on this walk. Hey - 1.8 miles is better than 0 miles! Plus it seems like you got in lots of walks this week! How's the weather holding up?? btw - with all the pictures, it looks much farther than 1.8 miles!